Personally, I’d go with the single page version but I’m sure the wide version will be appreciated by many too. Damn, that site is pretty awesome, they have tons of the old Gameinformers from the 90s when it started. I hope this doesn’t depreciate the value of my player’s guide.. Just kidding. 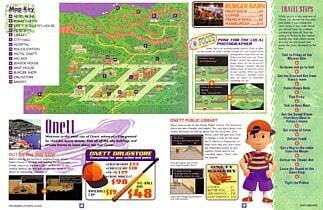 I’m glad the people will get to experience the EarthBound players guide. It’s totally awesome. I downloaded the whole player’s guide back then as a gigantic file of scans, so it’s rather unhandy to navigate, but wow, hi-res pdfs! Awesome! Yeah, the single page version is the way to go. There is a viewing method in Adobe Acrobat Reader which allows the single page to be viewed with the multi-page maps properly aligned. Open up the single page version pdf in the latest Adobe Acrobat Reader. Click on the View menu and mouse-over Page Display. Check only Two-Up and Show Cover Page During Two-Up, uncheck the rest. Everything will flow smoothly now with properly separated pages which visually appear conjoined. What luck! With this, I can show my pals at school what EarthBound is! I got a different PDF of the Player’s guide. I really wanted to see what it looked like in person, so I bought the book. I have to agree with Tomato, it’s better to have in real life than on a computer. Well this is certainly better than the old scanned version that was lying around with weird angles and such. My EarthBound guide is my most-loved (A.K.A poor-conditioned) book, so I avoid touching it, for it is delicate. This digital version will be a nice reference tool. My guide’s so worn out. I used to read it every so often because it’s so well-constructed – if not the source of some childhood frustration. I’m really glad for this because I don’t like to use my guide for art reference anymore. But yeah, nothing will beat having the actual guide in my hands. Both the history I have with it, and tangibility of the format. The same applies to Fangamer’s handbook :). But, it’s not always a realistic option for folks to get the EB guide. This is really awesome. I’m getting my girlfriend to try and play this game – but my hard copy of the strategy guide is about 1400 miles away in my parents’ basement, since I didn’t want something to happen to it on the move. The amount of work put into it compared to things today is really incredible and it’s fun to just read. Does anyone else know any strategy guides with merit outside of the advice they give? Or, even better, where to find digital copies? I remember LoZ:LttP’s being pretty nice. That’s great for me. I imported my copy of EarthBound back in the day and couldn’t ever even take a look at the Player’s Guide because I bought the cart only. It’s funny, I own the game plus the guide, but this is my first time actually seeing it in such good condition! I bought my copy used from Blockbuster back in the day, and the guide was already pretty wrecked, and in it’s current condition is hardly legible! How about everyone else? 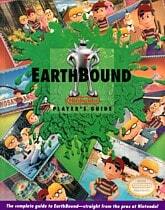 What condition is your Earthbound guide in? When I got the game I would read the player’s guide all the time, even after I finished the game. I would even read it in the bath tub! So my original players’ guide is legible, although it appears to have been through a hurricane. I still have my original guide. It has served me well over the years, and even though some pages are falling out, it’s still sweet! I even have 5 of the 6 scratch and sniff cards in the back. I sent the pizza one in for an air freshener…which I still have. What’s the difference between these and the ones posted on starmen.net? I’ve been reading it lately. It’s pretty sweet! I’m glad they made the Mother 3 handbook similar to the original Player’s guide. Reading through this convinced me to finally buy the Mother 3 handbook. I can’t believe it took me so long… I’m excited about its arrival. wish i wouldn’t seen this post when it was first made. it’s only on scribd now, & no matter what, i can’t get it to download. is it in any other location? This is awesome! I have the single page version and I love it! I was really wanting this guide and I felt like I was missing out because nobody’s selling it for a cheap price. So thank you! Download the file on a tablet and then play the game, emulates the original experience-ish. Awesome! i always wanted to read the player’s guide! i think I’ll play EB again but following the player’s guide this time rather than an online walkthrough. Wow, is the guide realy that good? I never got guide books because I thought it ruined the experience of beating the game yourself.